I read this article and found it very interesting, thought it might be something for you. The article is called Metro For Mumbai Only By 2021–God Willing and is located at https://archive.indiaspend.com/cover-story/metro-for-mumbai-only-by-2021-god-willing-13678. For years, Priyanka Dias, 25, a business analyst with a global IT firm in the special economic zone of Santacruz Electronics Export Processing Zone (SEEPZ), in the western suburb of Andheri, spent 1.45 hours travelling from office to home for roughly a distance of 18 km during peak hour traffic. That’s 10.28 km per hour. Most of this time, roughly 45 minutes, was spent commuting a meagre 5.2 km stretch from SEEPZ to Andheri railway station. This means she travelled 1.9 metres per second, which is comparable to the pace of beetles and faster than that of spiders, tortoises and snails. On good days, Dias took a bus; on others she took her chances with an autorickshaw. Mostly, she walked from office along the dusty, noisy, traffic-infested stretch to her destination. As it turns out, walking was the fastest way of getting there. This was before the 11.4 km-long, Rs 4,300-crore Metro Line 1, Mumbai’s first modern mass rapid-transit system line, linking Ghatkopar in the east to Versova in the west, opened in June 2014. Today, 1.1 million passengers use the east-west link, and Priyanka’s own commute has been reduced by 30 minutes on this dreaded stretch of land. Line 1 is part of the Rs 72,500-crore Mumbai Metro Project, the largest transport project Mumbai has ever undertaken. If implemented, it could change the face of India’s financial capital. In the decade leading up to 2005, Mumbai witnessed a 137% increase in cars, 306% increase in two-wheelers, 420% increase in autos and 128% increase in taxis, according to the Mumbai Metropolitan Regional Development Authority (MMRDA)’s Comprehensive Transportation Study (CTS) of 2008. During this decade, the minimum average travel speed, the slowest recorded travel speed, fell from 30 kmph to 5 kmph in the suburbs and from 18 kmph to 8 kmph in the island city. About 78% of Mumbai uses public transport, which is great at a global level. But this is primarily because people have no choice. The MMRDA study notes that the use of public transport in Mumbai is chiefly the product of other phenomena, such as “unusually compact urban form, high densities, low incomes and lack of affordable housing”. Although Metro Line 1 has cut Priyanka’s travel time, she still braces for a jam-packed turbulent 30-minute-long suburban train journey that often sees her travelling on the footboard of a train coach. Mumbai’s suburban rail system is one of the cheapest in the world, but its low cost comes with a deadly penalty: around 10 people on average die every day, CTS noted. A US Federal Transit Administration report of 1996 has described a density of five passengers per sq m as “totally intolerable” and eight passengers per sq m as “unacceptable”. In Mumbai, it is common to accept the unacceptable. The MMRDA estimated that on average, 12 passengers stand in a sq m, rising to 16 persons per sq m between car doors during peak hours. The Indian Railways officially calls this “super-dense crush load”. With the situation only likely to worsen, planning authorities view the introduction of a metro rail rapid transit system as a panacea for Mumbai’s transport tribulations. Every day, 11 million passengers in Mumbai use public transport, and MMRDA has projected that roughly 7 million passengers will benefit from the metro and substantially unclog road and railway traffic. “When the CTS was carried out, we realised Mumbai should have gotten a Metro a long time ago. This was the first moral of the story,” Sanjay Sethi, managing director of the Mumbai Metro Rail Corporation Ltd (MMRCL) told Indiaspend. The MMRDA in its metro proposal noted that the existing suburban rail system is “under extreme pressure and the public bus system’s role is limited to providing feeder services for the railways”. However the metro is riddled with delays and cost escalations. Mumbai’s population and vehicles are set to rise over this decade. MMRDA’s study, from trends recorded in the base year of 2005, has estimated that that by 2031, the city’s population will grow to 34 million from 12.4 million and vehicular growth will expand to 9 million from 2.3 million today. In 2004, the MMRDA finalised the Metro masterplan, which proposed a 146.5 km rapid-transit system for Greater Mumbai to be completed by 2021. With Line 1 opening only this year instead of 2012, and work on the other corridors not even started, the plan itself needs to be revised. As of today, the plan consists of just three more corridors—Colaba-Bandra-Seepz (32.5 km), Dahisar-Bandra-Mankhurd (40.2 km), and Wadala-Thane-Kasarvadavali (30 km)—which, along with the already commissioned Line 1, will create a network of 114.1 km, integrated with the existing commuter railways and thus connected to the island city, the suburbs, commercial hubs, and the airport. The costs have ballooned from Rs 67,618 crore (2012 estimates) for nine corridors to the new revised estimate of Rs 68,202 crore for the three lines now left. MMRDA estimates that it will take roughly six to seven years to complete construction of each metro corridor after tenders are finalised, which they are currently are not. Except for the completed 11.4-km Line 1, no construction has started on the three corridors of 102.7 km. While the tendering process for the Colaba-Bandra-Seepz Metro has begun and the line is expected to be commissioned by 2021, the other two corridors are still on the drawing board, having just received clearance from Maharashtra’s new Chief Minister Devendra Phadnavis last month. “We need a solution that is urgent to respond to the growing problem. A delayed answer through the Metro is not something Mumbai can afford. The current project cost estimates are almost equal to the size of three annual budgets for Mumbai,” Madhav Pai, director of urban transport think tank Embarq India said. If the experience of building metro corridors in other cities around the world is any indication, the project is more likely to take 10 years to complete after the implementation phase begins. “By this time, car ownership may triple, bringing in a host of new traffic-related transportation problems for the city,” Pai said. Might a bus rapid transit system (BRTS), which involves creating dedicated bus lanes on arterial roads, be a faster and cheaper infrastructure addition for Mumbai? It would cost a tenth of the metro. “The Metro system fares even at the initial discounted rates for Line 1 are pricing out the poor,” Pai said. 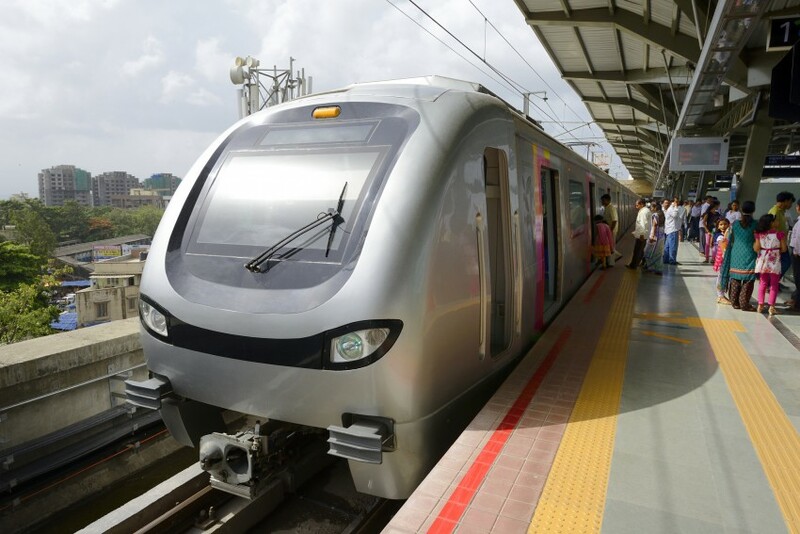 Presently, the initial promotional fares are only marginally above that of the suburban railway, but the ongoing fare war between MMRDA and project operator, Mumbai Metro One Private Limited, raises serious concerns of affordability. If the project operator’s proposed initial fare structure prevails, with a 100 % hike from current maximum fares, Mumbai will have India’s costliest metro system. The controversy snowballed during the preparation for Line 1’s inauguration, with former chief minister Prithviraj Chavan even threatening to boycott the opening ceremony. A month after commissioning the line, MMRDA moved the Bombay High Court seeking a stay on the fares of the Mumbai Metro. “The project as it currently stands is a service for de-clogging roads that are used by barely 10% of the population that owns cars. The huge costs involved at such a large scale would be better directed towards low-income housing, public education and healthcare,” said Pai. The metro, according to Sethi, must be viewed as complementary to the train and bus network, which transport 56% and 26% of commuters, according to the CTS. “These systems are efficient and comprehensive—the new Metro serves to decongest them and offer an alternative mode of public transportation. Mumbai has one of the highest shares of public transport usage and the Metro is being built keeping this in mind,” Sethi said. Still, Mumbai’s planned and existing Metro network is much smaller in comparison to other world cities. With more than 500 km of rail infrastructure, Shanghai has the world’s largest metro network, followed by Beijing, another fast-growing network in China. In fact, according to the International Association of Public Transport and the International Railway Journal, Asian cities take up 5 of the 10 top positions for largest network connectivity. London is the longest non-Asian network in the ranking, with New York, Moscow, Madrid and Paris completing the table.